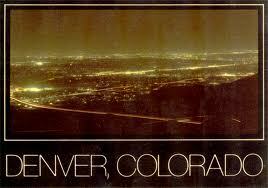 The following is a fictionalized version of a true story I read in one of the Denver newspapers when I was a boy. He was just an electrician, blue-collar, working class. Other men were teachers, doctors, lawyers, important. Making big decisions in the world. He just ran wire in houses, attached outlets, lights, switches. And he fixed things. Toasters, mixers, that kind of stuff. He was good at it. But he couldn’t fix this. Each night when he returned from work, he kissed his wife and asked, “How is he today?” This night, tears in her eyes, hands on her apron, she shook her head. He wrung his big calloused hands, feeling helpless. The room was dark despite the drapes on the lone window being wide open. Outside dusk fell on Denver. The electrician switched on the light. His son started in his bed. “Don’t, please,” his son whispered. “I want to see the stars.” The boy had always loved the stars and talked of becoming an astronaut and being the first to land on the moon. Not now. The electrician looked at his son’s skelatal face and flicked the light back off. He turned and wiped away his tears. He had moved the boy’s bed to the center of the room facing the window so the boy might catch a glimpse of those stars. It’s all he could do for him and hope shone in the boy’s eyes, when he caught sight of just one star. Now the boy could not see well enough even for that. The father sat next to his son, helpless, praying. He started his truck and pulled back onto the road. The city lights danced below. Then it came. An idea. “Not yet.” After supper, the father descended into his workshop in the basement. “Come to bed. What are you doing down there?” his wife called down, late. “You’ll see. Go to bed,” he answered. Every night Christmas drew closer. And every night he worked harder. Finally on Christmas Eve, as he prepared for work, there was a new spring in his step and the tiredness that usually fell on his shoulders lifted. He kissed his wife. When he came home he visited his son. Sitting there next to the bed he wiggled in his chair like a child. After the boy fell back to sleep, he drew the drapes closed on the window. Then he went to the garage and drug out a ladder. 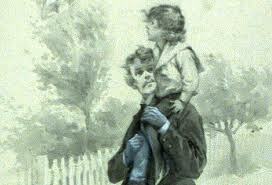 And trudging through the snow, he leaned it against the bare tree outside his son’s window. Then he retrieved his project from the basement. As he climbed up and down the ladder his wife looked out the back door but never asked. It took him until after dark but soon all was set–just as he had imagined. He took his wife by the hand and crept into his son’s room. The electrician’s heart beat like a drum in his chest. “Son, son,” he said , shaking his boy gently. “Look!” And just then he drew open the drapes. From that night, Christmas Eve, until his son closed his eyes for the final time, bright, white stars of hope–big enough for the boy to see–shone just outside the boy’s window. The father, just an electrician, had made the stars come out. And they still shine today. For those stars were lights the electrician father strung together in his basement and hung in the bare branches of a tree to give his son a final Christmas gift. Those stars are the lights we string on houses and trees from coast to coast during the Christmas season. 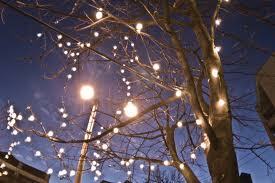 Christmas lights then are more than decorations; they are advertisements of a father’s love. And of a Father’s love. Our heavenly Father sent us a Light of hope too. Several thousand years ago a Jewish writer named Isaiah wrote, “The people walking in darkness have seen a great light.” He was writing about the coming of Jesus. 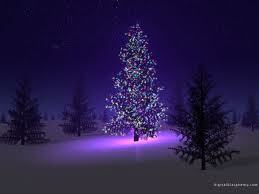 The first Christmas Light lifted up on a rugged tree. “I am the light of the world,” Jesus said. May the light and peace and hope of Jesus Christ illuminate your coming and going today, tomorrow and forevermore. Eugene C. Scott proudly lives in Denver, where this story took place and he hangs lights on his house every year. He loves stories, fictional and non and is writing a novel. But isn’t everyone. He also co-pastors The Neighborhood Church which will celebrate the birth of Jesus with a Christmas Eve service at 5:30pm. Go to tnc3.org for more info. Thanks, Eugene,…very inspirational,…I’ve always loved the stars,…now I realize what’s so great about all those Christmas lights!,…somehow, I’ve never equated them in quite this way,…& sometimes I feel like I’m living a novel, but doubt that I’ll ever write it! You may not be writing a novel but God, the Author of your life is. And I imagine it’s quite a good read. Merry Christmas. I just read your story aloud to Larry and I could hardly get it out because I was so moved to tears. When I finally finished, Larry said, “that’s my boy!” Thank you. I don’t think I will look at any Christmas lights the same ever again! Wow, Linda thanks. Love you two. Will we be seeing you at all?